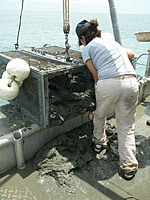 The first step in most biological studies is fieldwork — to collect needed specimens or fossils from field localities. For bivalves, collecting takes many forms — from simple collecting by hand, to shovel-and-sieving in sand or mud, snorkeling or scuba diving on reefs, or bottom sampling from large ships. Once collected, the specimens are preserved in whatever fluid is best for how they will be analyzed in the laboratory — alcohol or a special salt solution for molecular work, formaldehyde-based fixatives for dissection and histology, or glutaraldehyde for electron microscopy. 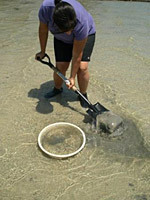 Collecting by shovel and sieve. 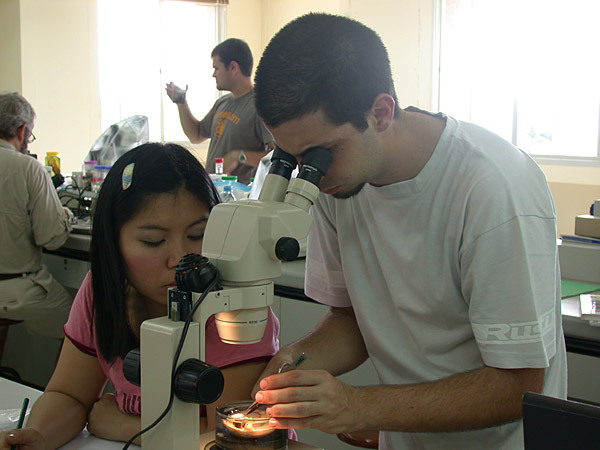 The study of cells and tissues at the microscopic level.. 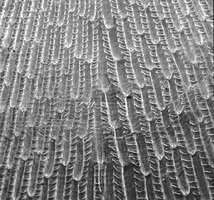 These techniques reveal the structures of shells, organs, and tissues. Dissection guides to use in your classroom can be found here. 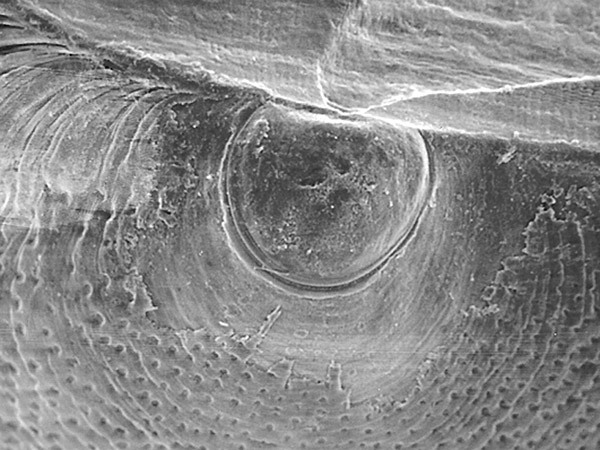 Bivalve dissection by light microscope. An unpreserved Hard-Shelled Clam (Mercenaria mercenaria) from a local fish market reveals its beautiful anatomy during classroom dissection. A form of microscopy in which the interactions of electrons (instead of light) with a specimen are used to provide detailed information about structure. 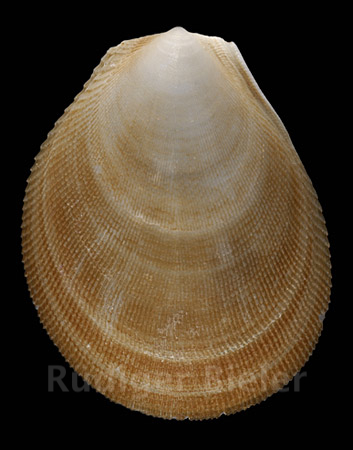 uses high-energy electron beams (instead of light) to examine and photograph bivalve shells and anatomy. Scanning electron microscopy (SEM) provides high-resolution images of outside surfaces, like sculpture, a hinge, or the appearance of the siphons. 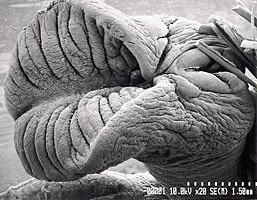 Transmission electron microscopy (TEM) provides very fine details of cross sections of tissues, such as sperm still under development within a bivalve's reproductive tract. Transmission electron micrographs (TEM) of the mature sperm cells of the heart cockle, Lunulicardia. 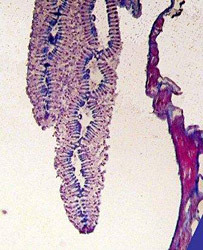 Histology is a more traditional technique of embedding tissues in paraffin wax or plastic, then sectioning the block, mounting the thin slices on microscope slides, and staining them to help distinguish one type of tissue from another. Histology allows scientists to examine the inner structures of soft anatomy, or to reconstruct the anatomy of species that are too small to dissect by hand. 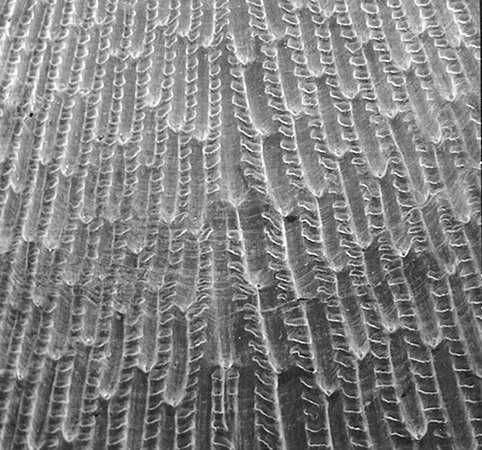 The stained histological section of the gills of a Venus Clam (Pitar simpsoni). 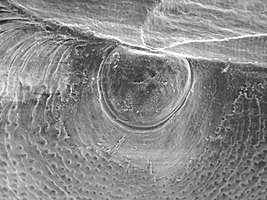 The two lamellae of the gills on one side of the clam, plus the internal structure of the gills — tissue connections that give the gill added stability — are clearly visible to the left of the darker pink foot muscle. DNA or RNA isolation and sequencing are very valuable methods to determine evolutionary pathways and relationships among bivalve species. 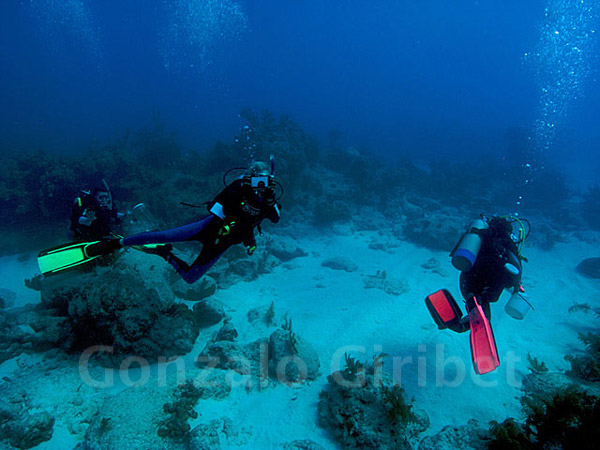 In some ways, they can be more useful than morphology, because DNA is less influenced by external forces such as food, temperature, and the shape of the rock to which a bivalve is attached. Below are the basic sequencing steps but a more detailed animation can be found here. 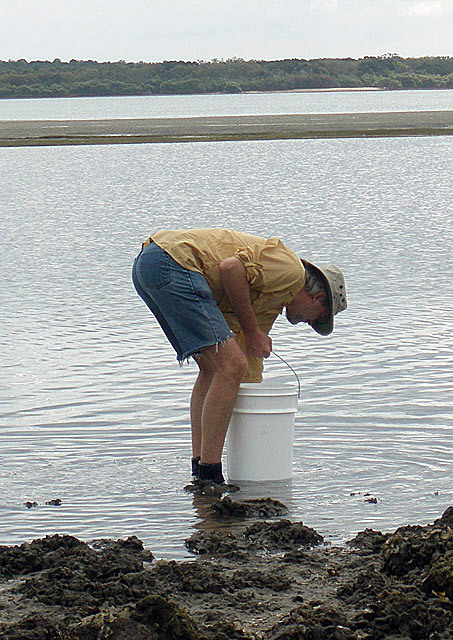 Prepare the sample — Tissue taken from the muscle or mantle of a fresh bivalve is preserved in alcohol or another special preservative. Extract DNA or RNA — A chemical process isolates and purifies the DNA or RNA from the cells of the tissue sample. The end product is a small tube containing DNA or RNA in water. Choose the gene — Genes are made up of DNA — individual sequences that control how cells function. Most research projects focus on one gene or a small set of genes for their studies. The procedure is a little different for each gene. Sequencing the entire genome is very expensive, time consuming, and for most studies, unnecessary. Amplify the gene using Polymerase Chain Reaction (PCR) — This technique makes extra copies of the desired gene, using chemical and heat cycles, to produce enough of the gene to use in the sequencing procedure. A PCR Thermocycler machine does this, using chemical and heat cycles to duplicate the gene. The pattern formed by zones of separated pigments and of colorless substance in chromatographic procedures. with the four bases of DNA color-coded for easy reading — red A (adenine), green T (thymine), black G (guanine), and blue C (cytosine). Compare the sequence - The sequence is then compared with those from other bivalves, matching the sequences of bases that are alike and those that are different. The sections that are different provide molecular "characters" that will be used in phylogenetic analyses. A single attribute of an organism. (the traits and sequences for each organism) used in the analysis. See the Cladistics Activity for a more complete description of this method.